You’ll laugh when I tell you this. I had a dream. Back in late October, so like seven months ago. And you know, in dreams, fantastical mash-ups happen. You end up sitting in public transit petting some queer hipster’s siamese cat who stares at you and asks “How you doin’” and you answer that the weather’s lovely. And then you wake up an feel this second hand embarrassment crawl up that touchy part of your collar bone and into your ears which by then are burning like the nichrome wire in your grandmother’s toaster oven. I dreamed of this strange group of four. And what do all of us do when we wake up from a dream, of course, we draw it out. Literally, on the first sheet of paper scavenged up by our eyes. But after I blueprinted this beast of beauty, I was succumbed by a loud trumpet-blast of guilt. It was so bad. Like bad, you know, like you want to share it with someone very badly, but you can’t because it’s so darn bad. But the thought consumed me at last, and I finally did it. And it suddenly struck me..
To make the devil’s food cake, line the bottom of two round 9-inch cake pans with parchment paper. Preheat the oven to 350 degrees F, with the rack in the middle. In another bowl, beat the sugar with the eggs and oil until thick and pale. Stream in the buttermilk, coffee, and vanilla. Add the egg mixture to the flour mixture and start mixing on low speed to prevent splashing, as the batter will be thin, then increase the speed with confidence finishing with about 5 seconds at the highest speed. I find that this will break apart any little lumps of flour without giving time for the gluten to develop, hence yielding a finer cake without the crumbs being so delicate that the cake falls apart. Pour the batter evenly into the prepared pans and bake for 30 to 33 minutes, or until a toothpick inserted comes out with moist crumbs attached. Cool completely and unmold the cakes by running a butter knife along the sides of the pan then inverting onto a big piece of plastic wrap. 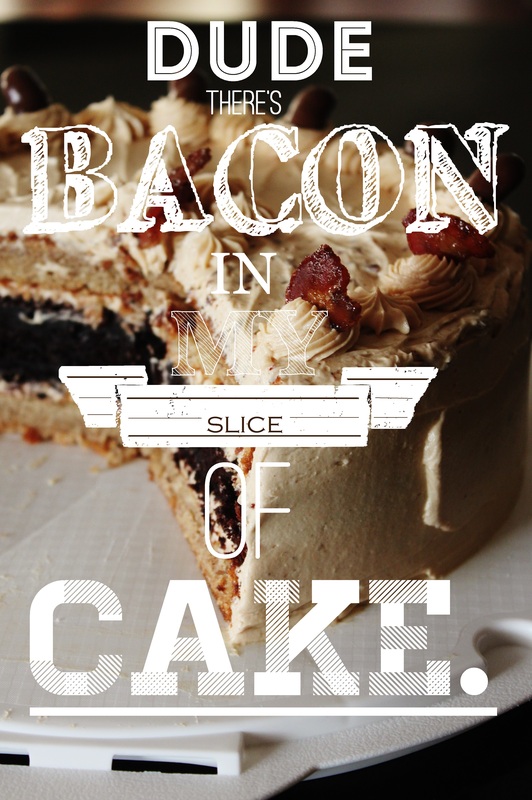 Wrap the cake snugly and refrigerate for up to a week (as you make the other components of the bacon cake) or give yourself even more chill time by freezing the cakes for up to 3 weeks. For this cake I only used one chocolate cake layer. To make the banana cake, preheat the oven to 325 degrees F, with the rack placed in the center of the oven. Line the bottom of two round, 9-inch cake pans with parchment. Put the butter and sugar in the bowl of your stand mixer (I have not dared try this recipe with a hand-held mixer, since Momofuku specially advised me not to) and using the paddle attachment, cream the contents until light and fluffy. Scrape down the bowl and add the egg, mix on low speed until creamy. Stop the machine and scrape down the bowl. Continuing on low speed, stream in the buttermilk, oil, and vanilla very slowly so no separation happens. Stop, scrape the bowl, then add the banana puree slowly with the mixer running. Meanwhile, sift together the dry ingredients. Add to the mixer bowl, and start on stir speed, so flour doesn’t fly everywhere, and increase it to finish at high speed (8) for about 3 seconds. Spread the batter evenly into prepared pans, and bake for 35~40 minutes, or just until done; a toothpick inserted should come out with moist crumbs. Cool completely, run a knife along the side of pan to remove, then wrap snugly in plastic wrap. Chill up to 5 days or until ready to assemble. Wrapped, the cake can freeze for 3 weeks or so. To make the praline, first heat your heavy-bottomed frying pan to medium-high heat. Once the pan is hot, add the bacon (a hot pan prevents sticking). Once the fat starts to render out, reduce the heat to medium-low. Be patient and let the bacon crispen gently; you want all the moisture to be gone. When you get to the point where the bacon begins to caramelize, and you feel like you really really want to eat a piece, add the sugar. Stir until the sugar melts and begins to foam. Take the pan off the heat and spread the praline onto a piece of parchment to cool completely. The sugar will harden as it cools. Reserve 16 pieces of the praline, and put the rest in the food processor and pulse it to little bits – you will need this for the frosting. To make the buttercream, cream together the butters with the salt and vanilla in your stand mixer using the paddle attachment. Add the sugar and beat until smooth. Scrape down the bowl, then with the motor running, stream in the cream, until very thick and smooth. This buttercream is rich and soft when you make it – if it seems a bit dry, add about 2 more tbsp heavy cream. Mix in the bacon bits. Use immediately. To assemble the cake, put a banana cake layer on your serving platter. Frost the top. Add a chocolate cake layer. Frost the top. Add another banana cake layer. Frost the top, then the sides of the entire cake. Put any remaining buttercream in a piping bag fitted with a ride round or star tip and pipe 16 little mounds onto the edge of the cake. Garnish with the reserved bacon praline.